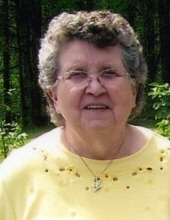 Lois Ann Stiltner Owens, 80 years of age of Vansant, VA passed away April 13, 2019 at her second home in Campobello, SC after an extended illness, surrounded by her family. She was born July 22, 1938 in Grundy, VA. She was the daughter of the late William Muncy and Matele Stump Stiltner. Lois married Vernon Owens and was blessed with 47 years together as husband and wife, before his death on October 24, 2006. Lois was a dedicated Christian and a member of the Big Prater Primitive Baptist Church for 54 years. She was a devoted mother, grandmother and great grandmother, and a loyal friend. She was loved and respected by her family, her friends and all who knew her. Lois enjoyed working in her garden, sewing, crocheting, quilting and spending time with her family. Lois worked at the Ben Franklin Store and ten years as a teachers aid in the Buchanan County School System. In addition to her parents, she was preceded in death by her husband Vernon Owens, two brothers Bob and Luther Stiltner. Those left to cherish her memory include her children Greg and wife Teresa Owens, Gary and wife Donita Owens, and Geoff Owens and companion Alicia Stow all of Campobello, SC. Grandchildren Eric Owens of Inman, SC, Whitney Gardner of Augusta, GA, Cody Owens of North Hollywood, CA and Racheal Owens of Charlotte, NC, two great grandchildren Eli and Zach Gardner of Augusta, GA and a sister Linda Owens and husband Parker of Abingdon, VA; several nieces, nephews and canine friend Rosie. Visitation service for Lois Ann Stiltner Owens will be at the Shortridge-Ramey Funeral Home Chapel of Keen Mountain, VA Tuesday, April 16 at 6:00 p.m. In honoring Lois’ request, a Grave side Service will be held at the Greenhills Memory Gardens at Claypool Hill, VA Wednesday, April 17 at 1:00 p.m. with Elder Jeffery Arnold officiating. The family suggests that expressions of sympathy be made in the form of donations to the American Cancer Society “Relay For Life”. Online condolences may be sent to www.shortridgeramey.com. The family of Lois Ann Stiltner Owens have entrusted the care of their loved one to Shortridge-Ramey Funeral Home of Keen Mountain, VA.
"Email Address" would like to share the life celebration of Lois Ann Stiltner Owens. Click on the "link" to go to share a favorite memory or leave a condolence message for the family.